Marburg in what is now western Germany was one of Hesse's key cities. It is situated in what was central Hesse, located on the River Lahn, and had usually served as the capital of the early duchy before Kassel superseded it. The landgraviate of Hesse was a single, unified, and enlargened state from 1458, following a division of territory within the Holy Roman empire. The landgraviate was now centred on the city of Kassel and the new ruler, Ludwig III (IV), created a sub-landgraviate for his younger brother, Henry. This was based around Marburg, capital of the Oberhessen half of the state (Upper Hesse), which had now been relegated in importance. Ludwig remained the senior landgrave in Hesse, which meant that he largely took care of state matters while Henry concerned himself with local governance, at least in theory. This first creation of the landgraviate of Marburg ended in 1500 when William the Younger died without having produced a male heir. Very soon afterwards, Duke Philip the Magnanimous acceded to the senior title at the age of five. He soon became the single most influential figure in the history of all of the various Hessian territories. One of the political leaders of the Reformation, it was during his reign that Hesse played a role of great importance in the Reich (meaning 'empire' - in this case the Austrian-dominated Holy Roman empire which covered most of central Europe). Hesse's city of Frankfurt-am-Main was for a long time a free imperial city, serving as the location in which German emperors were crowned. Following Philip's death in 1567, Hesse was divided into the regions of Hessen-Kassel, Hessen-Marburg (recreating this division anew), Hessen-Rheinfels, and Hessen-Darmstadt, one each for Philip's four sons. The rulers of Hessen-Darmstadt continued to hold the title of landgraf ('landgrave' in English), although they formed the most junior of the four branches and, along with Rheinfels, the smallest of the four Hessen divisions, gaining just an eighth of the previous duchy's land. Thanks to its previous status, Marburg was the secondmost senior branch of this new division of territory. Its share of the former duchy's total land holdings amounted to fully a quarter, but its ruling line again died out quickly and a disagreement broke out about its future. In the end it was divided between Hessen-Kassel and Hessen-Darmstadt and effectively ceased to exist as a territory in its own right. Brother of Ludwig III (IV). Landgrave of Oberhessen (Marburg). Hesse is greatly enlarged following a division of territory within the Holy Roman empire. It is now centred on the city of Kassel. The new ruler, Ludwig, creates a sub-landgraviate for his younger brother, Henry who, in this year, marries Anna of Katzenelnbogen, daughter of the ruling count. This new sub-landgraviate is based around the old capital at Hessen-Marburg which has now been relegated in importance. Ludwig remains the senior landgrave in Hesse. Son. Predeceased his father (in 1478). The line of counts of Katzenelnbogen die out with the death of the last of their number. Still at the height of their territorial power and controlling the Middle Rhine valley for its lucrative customs tax revenue, their castle of Rheinfels now passes into the hands of Hesse (eventually to form part of the territory of Hessen-Darmstadt). William the Elder, landgrave of Hesse, goes on pilgrimage to Jerusalem. On his journey he contracts an illness (possibly syphilis). He abdicates his title in favour of his co-ruling brother, William the Intermediate, who becomes Landgrave William II. William the Elder lives in self-imposed exile in the town of Spangenberg in north-eastern Hesse. Brother. Landgrave of Oberhessen (Marburg). Died without an heir. William dies without having produced a male heir. Landgrave William II of Hesse therefore reunifies Hesse's divided territories to form a single, elevated duchy of Hesse. During this period, Marburg Castle pays host to the Marburg Colloquy, in which Duke Philip fails to get the two main divisions of Protestantism to agree a united front in the face of Catholic opposition. Following Philip's death in 1567, Hesse is divided into the regions of Hessen-Kassel, Hessen-Marburg, Hessen-Rheinfels and Hessen-Darmstadt, one each for Philip's four sons. Second son of Philip I of Hesse. Died without an heir. Ludwig of the House of Ydulfing and landgrave of Hessen-Marburg dies without producing a successor. Landgrave Maurice of Hessen-Kassel claims back the land and attempts to impose Calvinism upon its subjects, contrary to the rules of inheritance. This causes disagreements between him and Ludwig V of Hessen-Darmstadt, because Ludwig also inherits a portion of Hessen-Marburg's lands. 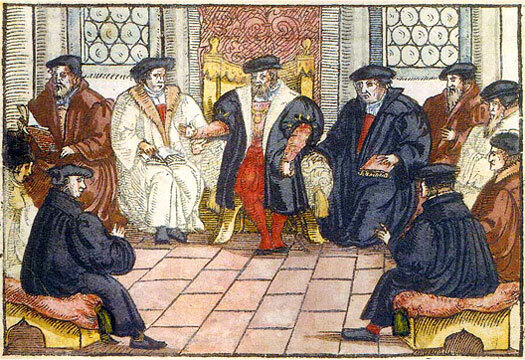 The disagreements evolve into armed conflict between the two in the Thirty Years' War from 1618 and are not resolved until the Peace of Westphalia in 1648. Part of Hessen-Marburg is ceded to Darmstadt in order to end the quarrel.